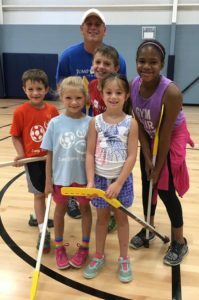 Floor Hockey: Players will learn puck handling, shooting, positioning and defending and will apply what they’ve learned in fun, low-key games under adult supervision. Safe floor hockey equipment will be provided. Deck Hockey: Boys and girls have a blast learning hockey fundamentals and playing games. Players are taught forehand and backhand passing and trapping, stick handling, shooting, defending, and goal keeping. They then play fun oriented, low competition games to help them learn team concepts. This is an excellent introductory program for children with little or no hockey experience. No equipment necessary.